This is the continuation of a series of examples and Demos tried earlier and uses Table and Form designed for earlier examples. If you have started on this Page please go through the earlier Topics and then continue. Click the Links Below or select them from the TRICKS Menu Tab above to open those Pages. The new method that we are going to try out is better in look and feel and very active in nature. The progress control is a small form and it is updated at record level, rather than based on the percentage of records processed, in the case of progress bar's indicator to advance forward. The display is self explanatory. At the start of the Program the ProgressCounter Form opens and initializes the fields with the Values of Program Name, Total Records to process and the process Start Time. Subsequent calls to the controlling program will update the Processed number of records and Process Time. 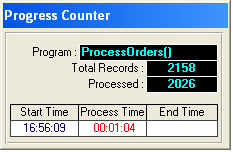 When process is complete the End Time control is updated and the Form stays displayed for 4 seconds, giving enough time to view the Total Time taken for processing, and then closes automatically. 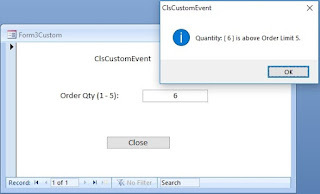 When the Program is active the Application is locked for processing and doesn't allow the User to close the Process Control Form or work with other objects in the database window. We will design the above Form with Label Controls as shown below. Open a New Form and add twelve Labels on the Form at the Detail Section. Arrange the Labels, in size and shapes, as shown below and fill the background Color of 3 Labels with dark Color and 3 Labels at the Bottom with White Color. Click on the Top left label in your design, display the Property Sheet (View Menu - - > Properties) and type Program: in the Caption Property. Change the Captions of other labels with the descriptions as shown above following the same procedure. Draw a Box around the Labels as shown. If the box overlaps the labels when drawn, change its Back-Style Property = Transparent. Next, we must change the Properties of the Form. Click on the Detail Section of the Form or on the horizontal bar above the detail Section with the description Detail. Display the Property Sheet and change the Height Property Value to 1.2396". If this size is not suitable for your present design then retain yours. Save the Form after changes with the Name: ProcessCounter. Give the name exactly as shown. No space between Process and Counter, because this name is referred in the ProcCounter() Program. We will use the same Demo Form ProgressMeter used for our earlier examples and the only change on that Form is the Command Button's On Click Property to call the Order Details Table updating new Program. Open the ProgressMeter Form. Click on the command button with the caption Process Orders and display its property sheet. Change the On Click property value to =ProcessOrders3() and don't forget the = sign. Save the Form. I have made a copy of our earlier program ProcessOrders() and changed the three lines that calls the ProgMeter2() routine for updating the Progress Bar in our earlier discussion. Since, the Program is a Copy of the earlier code I changed the Procedure Name to ProcessOrders3(). The code is given below for your convenience and you may copy and paste the Code into a Global Module and save it. ProcCounter 1, 0, recs, "ProcessOrders()"
You need the Order Details Table, that we have imported from Northwind.mdb sample database earlier, for this example also. I hope that table is still available in your project. If not download it again. If you forgot the location of the database visit the Page Saving Data on Form not in Table for location references. The ProcessCounter Form updating Program is given below. Copy and paste it into a Global Module in your Project and save the Module. Open the ProgressMeter Form in Normal View. Click on the Process Orders Command Button. 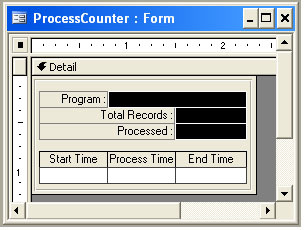 The ProcessCounter Form will appear updating the count of records already processed. Process Start Time and Process Time taken so far will be updated too. When the Processed records equals to the total number of records in the Order Details file, the End Time will be updated. The control will stay visible for about 4 seconds displaying the details and after that it will close itself. A delay loop is built into the ProcessOrders3() Program to slow down the action. You may remove this when you implement the code in your own project.